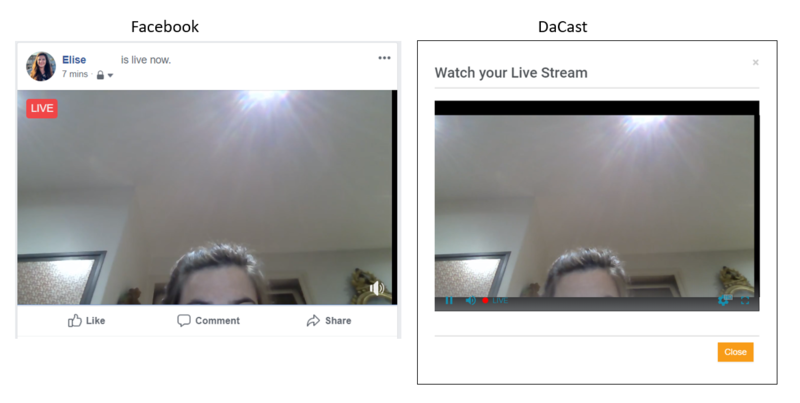 It is possible to stream simultaneously to Akamai (via the DaCast platform) and Facebook (direct playback in Facebook) via Switchboard Live and DaCast partnership. Do you need a paying Switchboard Live account? What if I am not a Switchboard Live customer? What is the advantage of the Switchboard Live & DaCast partnership? How do I simultaneously launch a stream to DaCast and Facebook via Switchboard Live? In a hurry? We got you covered with this video tutorial. Switchboard Live is a video distribution platform allowing you to simultaneously live stream across your own streaming platform (such as DaCast) and all the most popular social media channels (such as Facebook and Youtube). Yes. The minimum cost is $79 per month (billed annually) for 5 simultaneous live streaming destination. A 14-day free trial is also available. You can still use the multi-destination streaming method with your encoder to live stream simultaneously to Facebook and DaCast. Given its popularity with users, Switchboard Live has integrated DaCast directly into its video distribution platform. As a result, in just a few clicks you can simultaneously launch a live stream on your DaCast channel and on Facebook or/and any other social media channels available in the list. This method is faster than the multi-destination streaming method. In the future, we will integrate Switchboard Live into DaCast. That way, you’ll be able to set up all your live channels (to DaCast and any social media channels) directly from your DaCast account. 1/ Log in to your Switchboard Live account. 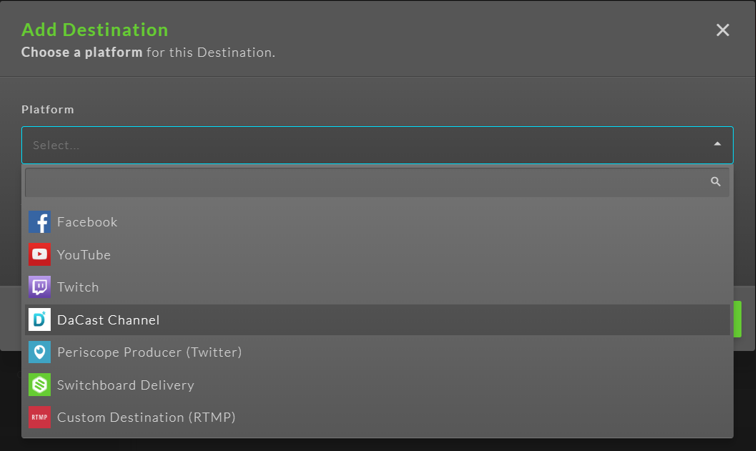 3/ Choose NEW DESTINATION and select DACAST CHANNEL in the drop-down menu. Enter the name of your Destination and click next. 4/ The next step relates to your DaCast API key. For this step, please log in to your DaCast account and go to PREFERENCES > API. *If you do not have access to this section, please contact DaCast directly. If there is nothing in the field “API key,” or if you want to reset your key, click REGENERATE. Then copy your API key. 5/ Paste your API key into your Switchboard Live account. Your list of live channels should populate as shown below (it may take up to 3 seconds). Select the live channel on which you want to stream. 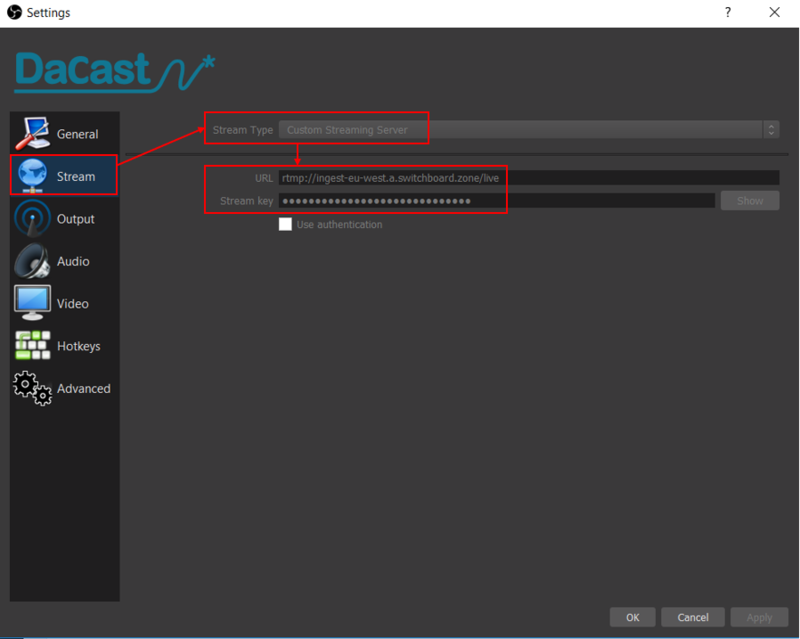 DaCast integration with Switchboard Live works with all types of DaCast live channels, including: html5, low latency and m3u8. 6/ Then click FINISH and you’ll see your DaCast live channel in your list of available destinations. 7/ Now, you can add Facebook. To do so, first click again on ADD DESTINATION. 8/ Choose NEW DESTINATION and select FACEBOOK from the drop-down menu. Name your new destination and click NEXT. 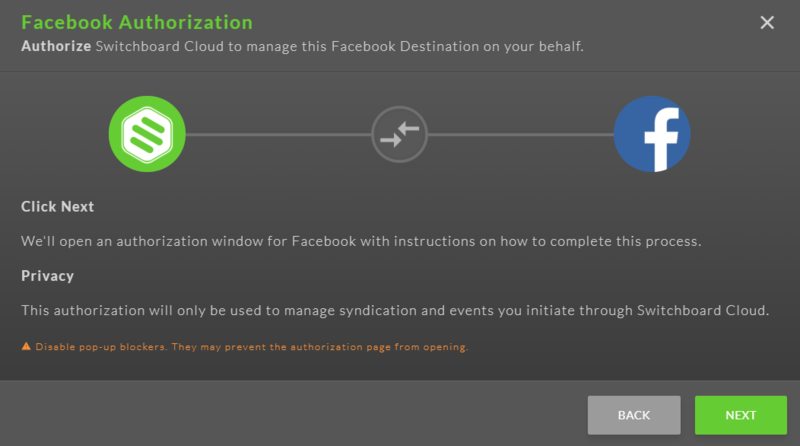 9/ Then follow the steps to connect your Switchboard account with your Facebook Account. The steps are very easy to follow; they will allow you to choose on which profiles (in case you have personal and business profiles) and on which pages or groups you want to share your live stream. 10/ Once you’ve added Facebook to your list of destinations, you need to set up your encoder. You can access this setup via the left section with the preview window from within your Switchboard account. Your stream URL will update automatically according to the origin selected (highlighted in red in the screenshot shared above). Now copy your stream URL. 11/ Now it’s time to open your encoder. In this tutorial, we use the DaCast version of OBS Studio. Click on SETTINGS then select STREAM in the left side menu. 12/ Select CUSTOM STREAMING SERVER for the stream type, then paste the Stream URL in the field URL. Do the same with the stream key that is in your Switchboard Live account. You’ll find the stream key just below the stream URL (highlighted in blue in the screenshot in step 10). Click on APPLY. 13/ Select OUTPUT and double check that you’ve selected RTMP, along with a video bitrate consistent with your internet connection (your internet upload speed should be double your video bitrate). Then click OK.
14/ Add a video source in your encoder. For DaCast OBS Studio, it can be done very easily by clicking on the + button in the sources widget. Then, you can select a video capture device, a media file, your desktop, etc. 15/ When you’ve added a video source, click on START STREAMING. 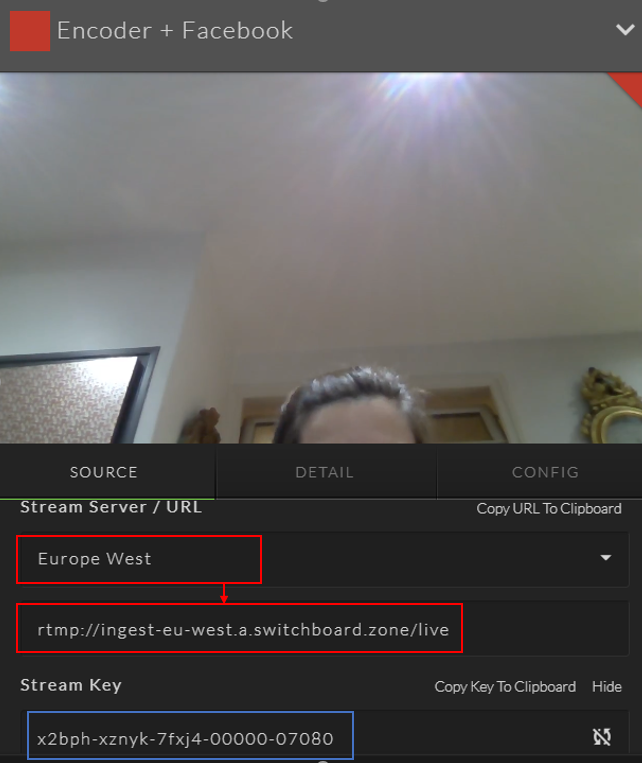 The preview of your live stream should appear in your Switchboard Live account, as you can see in the screenshots shared in steps 1 and 10. You can select up to 5 destinations, including more social media channels (and more) if you have a higher Switchboard Live plan level. Any questions? Call us or reach out to us 24/7 via our live chat. And happy streaming! DaCast has always been compatible with Facebook. However Facebook’s policy has changed. Now, Facebook requires you to set up your video content directly inside the Facebook platform, in order to play your content directly in your Facebook feed. Otherwise, Facebook now opens your video content in another tab. Thanks to our partnership with Switchboard Live or the multi-destination streaming with your encoder, it is now possible to play your DaCast content directly in your Facebook feed. Please note that the stream playing directly in Facebook depends on the Facebook network, not on DaCast. Therefore, any issue or limitations you might have on the stream playing in Facebook (for instance, live broadcasts limited to 4 hours) are related to Facebook.